Have you been watching Doomsday Arcade since the series started? Have you been feverishly catching up with all the episodes in anticipation of the series finale on Thursday? Fancy yourself an expert on all of the adventures of Shanks and Lunds as they battle to prevent the videogame apocalypse? Now's your chance to show your chops and take the Doomsday Arcade quiz. If you answer all of the questions correctly, you can unlock God Mode and get yourself a badge. Gearing up for the series finale of Doomsday Arcade is now even easier with the awesome Q&A with Doomsday mastermind, Shanks, as well as a sweet behind the scenes Doomsday Arcade Video. You do not want to miss the outtakes and behind the scenes from the last episode. 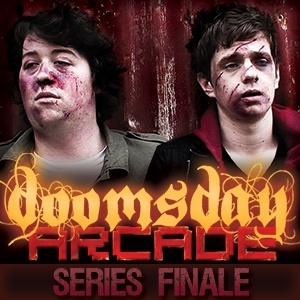 Don't forget to check back on Thursday at noon for the series finale of Doomsday Arcade.